The way we carry ourselves is an important part of body language. Posture refers to how we hold our bodies and the overall physical form of any individual. Not only does a posture and balance convey very crucial information about a person but also instantly reveal more about the person. Posture and balance are often ignored. These both play a significant role in our well being, particularly when it comes to healthy ageing. By improving them, we become stronger and mentally confident about ourselves. It is important to strengthen our core and lower back muscles. This wrapping of muscles around your middle supports our spine, also allows us to stand up straight and then maintain a better balance. Exercise can help strengthen our lower back. We can start this by lying on our stomach on a mat with arms extended. Then, we are supposed to Inhale and lift legs and arms off the mat at the same time. Hold for about three seconds and finally release, repeat this procedure for about 12 to 15 times. It is advisable to take regular breaks when it is required to maintain a same position over a long period. When you sit or stand for a long time, the spine will naturally compress, resulting in a hunched posture that can further lead to pain. What can help you here is to set reminders on your phone so you remember to get up, stretch and also check your posture. It will be extremely helpful for you if you take a regular yoga class which helps you work on your balance in many ways. Yoga poses focus on maintaining proper balance through slow breathing, a supported spine and focus. There are many techniques that can be translated into daily life, helping us retain a proper posture and balance. Avoid the slouch when walking. Start trying to walk as if you have a book or a heavy object balancing on your head and then it will come naturally. Test your balance whenever possible throughout your day. For example, When standing in line at the grocery store, try standing on one leg while you shift your basket from left or right or try getting into a particular yoga pose while watching Tv or surfing the internet. These small tests will help your body to maintain better balance as time passes. Start by adjusting your desk and surroundings for a better posture. A clean desk is always a good choice. 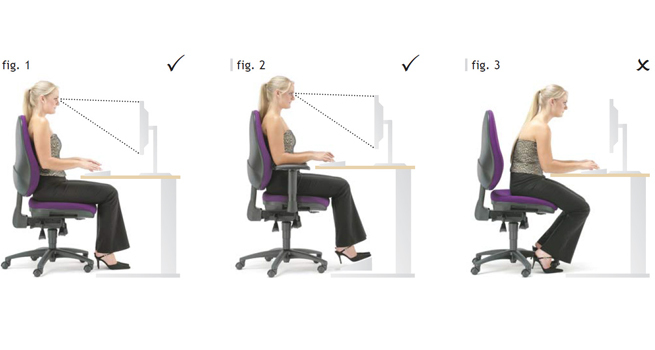 Now, adjust your chair so when seated with hands on your keyboard or table or whatever work, both elbows and your knees are bent to a 90-degree angle. It should become easy to sit with a straight back if looking at the screen. Also focus on your calves. If you let your posture rely more on your calves, You will feel an at ease attitude, and it will also put a bounce in your step. Not only will this free the rest of your upper body to relax but will become easier in assuming an upright posture that takes pressure from your back, shoulders and neck. A good tip that will benefit you is to keep your head straight, your ears and shoulders aligned. This will be an improvement in your self-esteem and attitude. Walk with your head up, you will appear more confident, and while feeling more confident improves your attitude and mood. The way we sit, stand, talk says something about us and whatever that is happening on the inside of us reflects on the outside as well. Therefore, it is important that we follow these few tips to feel comfortable about ourself and be confident about our personality.